Samuel Langley, from failure to posterity. Before consecrating his life to aviation research, Samuel Pierpont Langley (born in 1834), had distinguished himself with his work on physic and astronomy, and by publishing a book concerning "Experiments in aerodynamics". This eminent personality who was the secretary of the renowned Smithsonian Institute in Washington, could not ignore the new wave of enthusiasm to give wings to the ending ninetieth century. Closely studying the work of Clément Ader and Otto Lilienthal, he began building flying scaled models, propelled by rubber band motors, and having the particularity of a double set of wings mounted in the tandem configuration. Walker and Brown had previously invented this configuration, but Langley did not depart from it for about ten years, during which time he built countless models of this type. So many in fact, that this configuration of tandem wing machines, soon became known as the "Langley type". As Ader would borrow the Latin name "avion" from "avis" meaning bird, Langley would name all his apparatuses "Aerodrome" derived from the Greek "aerodromoï" meaning sky racer. Langley himself built his "aerodrome number 5" and achieved some success. On May 6th 1896, his apparatus flew (without a pilot) for over a minute, and came back to earth without damages. This experiment was repeated on several occasions, under the watchful eyes of Graham Bell, another genius of the era who invented the telephone. Graham bell was extremely impressed with Langley's machine. The "aérodrome 5" had a wingspan of 4.10 meters, weighing about 145 kilograms, tandem wing configuration, and a one horsepower steam engine driving two propellers located between the wings. For takeoff, Langley had developed a unique technique. Considering that he had a better chance of recovering his airplane intact by performing the tests over water, he catapulted his machine from a houseboat anchored on the Potomac River. In 1898, the United states were at war with the Spanish in Central America. The US Congress offered Langley a grant of $50,000.00 to build an airplane with a controllable engine. Samuel Langley however faced the same problems as those of his rivals: mainly the difficulty in obtaining a lightweight engine developing enough power. He called on Charles Manly, an engineer who conceived a radial engine developing 52 horsepower with a weight of 155 kilograms. Those were rare performance for the era. Langley had been convinced early in life, that the internal combustion engine would offer more performance in terms of power/weight ratio than the steam engine. He then began working on his new machine with provision for a pilot this time. On October 7th 1903, the airplane was ready for a test flight with a pilot. Great care had been taken in the construction, and Langley's airplane was similar in configuration to the preceding models: tandem wings, and engine in center position driving two propellers mounted between the wings. With Manly at the controls, the airplane was catapulted, but nosed dive immediately into the river without harm to pilot and machine. The accident was attributed to a strut catching part of the floating platform. Langley decided to conduct the experiment anew on December 8th 1903. This time, immediately following the launch, the machine entered a vertical climb, the aft wing broke off, and the airplane crashed into the river. The structure had failed due to the stress sustained on takeoff, and also due to the powerful engine. This time the airplane could not be salvaged, and the funds had been totally drained. Nine days later on December 17th, Wilbur and Orville Wright succeeded where so many other had failed. It is a certainty that Samuel Langley played an important role in the United States aviation history. However, we must recall that contrary to the Wright Brothers, he had directed most of his efforts on propulsion, with little thoughts on airplane control. So, even if the "aerodrome" could have flown, it would have been uncontrollable. Samuel Langley never recovered from his failure; he died demoralized on February 28th 1906. He will only achieve glory posthumously when in 1917 the United States would named one of the most prestigious air base in America in his honor, and the base that would become NACA later NASA flight test center. 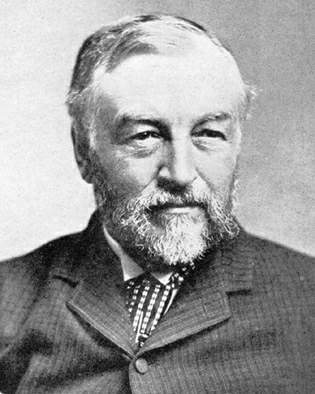 Samuel Pierpont Langley was a renowned and competent scientist. He was the author of physic and astronomy books as well as the inventor of the bolometer, an instrument which could measure a temperature difference of 1/100,000 of a degree Centigrade. 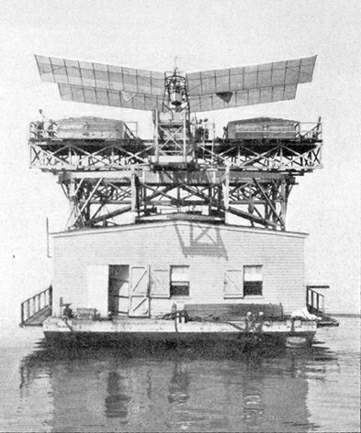 The "aerodrome number 5" pilotless machine, during Langley's experiments of 1896. 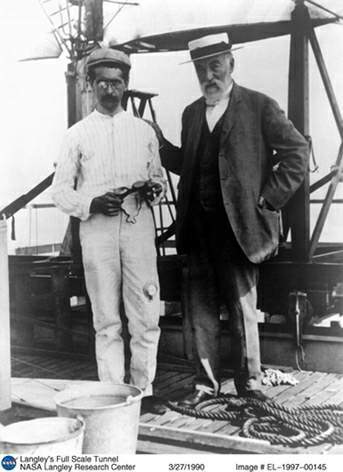 Samuel Langley and Charles Manley (left) on the floating launching platform anchored on the Potomac. The 52 horsepower radial engine designed by Manly. Truly a performing engine for the era. Langley's airplane on the launching platform, ready for takeoff. October 7th 1903: During its first flight, Langley's airplane nose-dived into the Potomac, without much damage however. December 8th 1903: Langley's airplane comes apart. Despite the sight of the wreckage, the propellers location between the two wings can be seen.